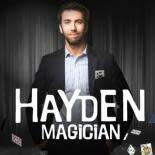 Hayden is an award-winning magician based out of Charlotte, NC who specializes in the art of illusion. He has performed for organizations nationwide such as Lowes and Bank of America and has been gaining popularity for his original and fast-paced magic show. Recommended for ages 13+.